The Bank of England has raised UK interest rates to 5.25% from 5% in an effort to curb inflation. 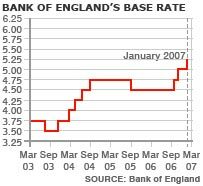 Analysts had been anticipating a rate rise in the near future, although they expected policymakers to wait until next month to take action. Consumer price inflation has recently risen to 2.7%, the highest level in more than a decade. The rise is the third in five months, as part of an effort by policymakers to stem inflationary pressures. The news will come as an unwelcome surprise to many homeowners. It will add £16 to the monthly payments of those with a £100,000 repayment mortgage. But the rise will be welcomed by savers if banks and building societies pass on the increase to their savings rates. In a statement announcing its decision, the Bank of England's Monetary Policy Committee said it expected consumer inflation to rise further in the near future. Inflation is already well above the government's 2% target and some analysts believe it will exceed 3% when the latest figures are published this month. "The timing is a surprise," said Ross Walker, UK economist with the Royal Bank of Scotland. "What this perhaps tells us is that we have a nasty inflation number coming next week and they wanted to act pre-emptively." Employer groups expressed disappointment at the move, saying it could harm already struggling businesses. "If part of the intention was to dampen wage increases, it is doubtful a rate rise will have the desired effect," said Ian McCafferty, the CBI's chief economic adviser. The FTSE 100 fell on the news amid concerns that the rate rise could constrain companies' growth and slow the housing market. The Bank of England has, in the past, announced rate rises in the same month as it published quarterly inflation figures but this time decided to make its move a month earlier. Experts thought it would wait for further evidence of how recent rate rises had affected this year's public sector pay agreements, and consumer spending over the festive period. In other reaction, the TUC said the move "smacked of panic" but the Institute of Directors described it as "tough but wise". "Inflation is well above target," said Graeme Leach, its chief economist. "The Bank of England's pre-emptive strike looks sensible." Several analysts said that rates could still rise further, possibly as soon as next month. The Council of Mortgage Lenders said those with variable-rate mortgages should factor the possibility of another rise into their future calculations. The Royal Institution of Chartered Surveyors said the rise, on top of others last year, was likely to dampen housing demand. In a separate move, the European Central Bank held its main eurozone base rate at 3.5%.